Pet therapeutic antibody firm adivo announces closure of seed-financing round German biotech company adivo specializing in generating species-specific thera-peutic antibodies for companion animals announces that it received a seed fi-nancing from three investors. The adivo team aims to address high medical needs in dogs including cancer and chronic inflammation, with the potential of expanding activities into the development of therapeutics for other species in the future. Adivo is a spin-out of MorphoSys and located in the innovation- and start-up center for biotechnology in Martinsried. Martinsried/ Munich, Germany, August 20, 2018 - adivo GmbH was founded by Dr.Kathrin Ladetzki-Baehs and Dr. Markus Waldhuber in March 2018. "Now, we are very pleased to have gained three strong and reliable partners that share our vision of promoting innovations in veterinary medicine. High-Tech Gründerfonds (HTGF), Occident Group AG and MorphoSys AG together served as investors in adivo, thus laying the base to make adivo a success going forward. We will use the investment to push our therapeutic antibody programs forward as well as to continuously improve the adivo technology, while at the same time seeking collaborations with pharma partners to leverage our approach for numerous projects" said Dr. Ladetzki-Baehs, Managing Director of adivo GmbH. "We are excited to be invested in a company which combines highly motivated people with a powerful technology. adivo will soon provide the right solutions to this market which is still defined by a significant number of high unmet medical needs." stated Cédric Barra, Investment Manager Lifesciences at Occident Group. adivo is passionate on developing new technologies to expand the range of therapeutic options for veterinarians and pet owners for their companions. A couple of years ago, when Dr. Ladetzki-Baehs' dog was diagnosed with cancer, she became aware of the lack of therapeutic options for her beloved pet. Knowing about innovations in human medicine, the idea was born to transfer the expertise in generating therapeutic antibodies for humans to the veterinary market. "Current antibody concepts used for pet therapeutics face a number of limitations and might not be applicable to each and every existing compound. 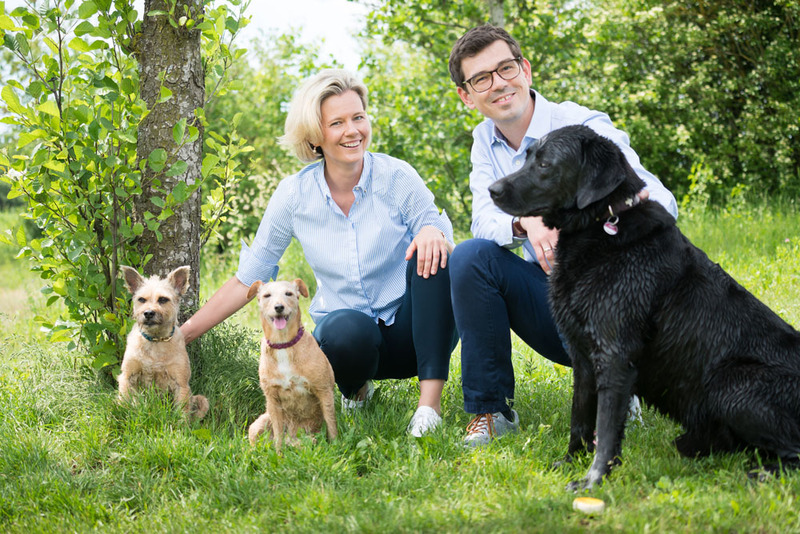 By developing adivo's fully canine-based antibody library towards commercialization, we hope that we will be able to generate therapeutics for dogs that are both well tolerated and efficacious," Dr. Waldhuber, Scientific Managing Director of adivo GmbH said. In 2018, adivo was founded focussing on therapeutic antibodies for dogs for unmet medical needs such as cancer and chronic inflammatory conditions. In order to facilitate and complete the realization of the adivo founding project, MorphoSys in 2018 granted adivo the rights to the newly built fully synthetic phage display antibody library, mimicking the canine immune globulin repertoire. "We are very pleased about this successful spin-out from MorphoSys. Today, antibodies are one of the most successful drug classes in human medicine. adivo's dog antibody library is a great and innovative approach addressing the exciting area of animal health with products generated based on the concept of MorphoSys's human antibody technology", commented Dr. Markus Enzelberger, Chief Scientific Officer of MorphoSys. "We wish our former colleagues the best of luck and are looking forward to seeing adivo generate new therapeutic candidates for animals." The company is located in the Innovation and Start-Up Center for Biotechnology (IZB) in Martinsried near Munich, offering a perfect place to implement new ideas and connect with other founders and biotech companies. adivo is a German biotech company based in Martinsried near Munich specializing in generating species-specific therapeutic antibodies for companion animals. The adivo team aims to initially address high medical needs in dogs including cancer and chronic inflammation, with the potential of expanding activities into the development of therapeutics for other species in the future. Using its fully canine-based antibody library, adivo, either alone or with partners, intends to generate therapeutics for dogs that are well tolerated and efficacious as well as to continuously improve its technology. High-Tech Gründerfonds (HTGF) is a seed investor that finances high-potential, tech-driven start-ups. With EUR 886 million in total investment volume across three funds (EUR 272 million in HTGF I, EUR 304 million in HTGF II, and a targeted volume of EUR 310 million for HTGF III) and an international network of partners, HTGF has already helped forge close to 500 start-ups since 2005. Driven by their expertise, entrepreneurial spirit and passion, its team of experienced investment managers and start-up experts help guide the development of young companies. HTGF's focus is on high-tech start-ups in a range of sectors, including software, media, internet, hardware, automation, health care, chemicals and life sciences. Investors in this public-private partnership include the Federal Ministry For Economic Affairs and Energy, the KfW Banking Group, and Fraunhofer-Gesellschaft e.V., as well as the companies ALTANA, BASF, B.Braun, Robert Bosch, BÜFA, CEWE, Deutsche Post DHL, Dräger, Drillisch AG, EVONIK, EWE AG, Haniel, Hettich, Knauf, Körber, LANXESS, media + more venture Beteiligungs GmbH & Co. KG, PHOENIX CONTACT, Postbank, QIAGEN, RWE Generation SE, SAP, Schufa, Schwarz Gruppe, STIHL, Thüga, Vector Informatik and WACKER.